One or more clients that execute the application business rules and provide the user experience. An application server that fulfills client requests for product data and file library transactions, and performs data indexing and maintenance functions. A SQL Server database server that contains your product data. In a single-user installation, all of these components are installed on one Microsoft® Windows™ computer. Most installations, however, will have one computer act as the database and file management server, and other computers act as clients. 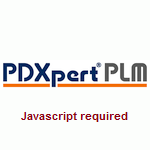 Servers do not have to be dedicated exclusively to PDXpert PLM software, although sharing resources with other applications and functions may affect system performance. The PDXpert installer automatically detects your Windows 32-bit or 64-bit operating system and installs the appropriate executable. PDXpert can be run in a mixed network of 32-/64-bit Windows computers. These are the minimum requirements for operating PDXpert and its SQL Server database on a dedicated machine with up to about ten users. Consider improving the system configuration when also supporting other software applications; services such as encryption, VPN and antivirus; and/or more than ten users. Hard disk 6 GB of available space on an uncompressed local disk2. The database will grow as you add PDXpert PLM product data objects; allow at least 10 GB. Additional space will be required for the uncompressed file library3. Do not install on a compressed, network-mapped, or external (e.g., USB) disk. Video display Minimum 1280×1024. For best viewing, use the latest .NET release and video drivers, with display scaling 100% @ 96dpi. Hard disk Up to 650 MB for application and data cache within user's %LocalAppData% folder (usually the C: drive). Do not install on a compressed, network-mapped or external (e.g., USB) disk. Microsoft no longer publishes 32-bit versions of SQL Server and Windows Server, and third-party components offer limited support. Future PDXpert Server releases may be published for 64-bit platforms only. The SQL Server installer creates temporary files on the system (typically C:) drive, even when installing to another drive. Verify that you have 4 GB (2008/2008R2) or 6 GB (2012 or later) of available disk space on the system drive for these files. Files are stored in a separate PDXpert library folder under Windows, with their metadata in the database. Windows Nano Server and the Windows Server Core install option do not include a Desktop GUI and are not supported. Our releases are tested for compatibility on Windows US-English using the latest service packs and updates. Verify compatibility with your localized Windows language and regional settings. Follow our recommendations to minimize incompatibilities between network devices, DNS services, operating systems and local languages, machine names and the workgroup or domain name. The minimum .NET Framework required for operation. Always apply the latest .NET service pack. The PDXpert system setup file automatically downloads and installs Microsoft SQL Server 2014 Express LocalDB. Any other SQL Server engine requires separate installation as described in the PDXpert PLM Software Installation Guide. Microsoft ended mainstream support for SQL Server 2008 and SQL Server 2008 R2 in July 2015. Microsoft has ended all support for SQL Server 2005. Use a supported database engine to ensure compatibility with PDXpert software. Per Microsoft guidelines. PDXpert increases efficiency by pooling database connections, so this value is not an absolute upper limit. The number of users that a specific SQL Edition supports will depend on factors such as concurrent use, client activities, network bandwidth and utilization, encryption, product data complexity, hardware configurations, and other server applications. Contact us for specific recommendations. We rely upon technologies from Microsoft and other suppliers that are constantly evolving. Always use Microsoft's supported versions of Windows, .NET and SQL Server. Apply the latest available service packs and updates. All hardware and software requirements and supported configurations are subject to change without notice. Updated 2019-01-18.